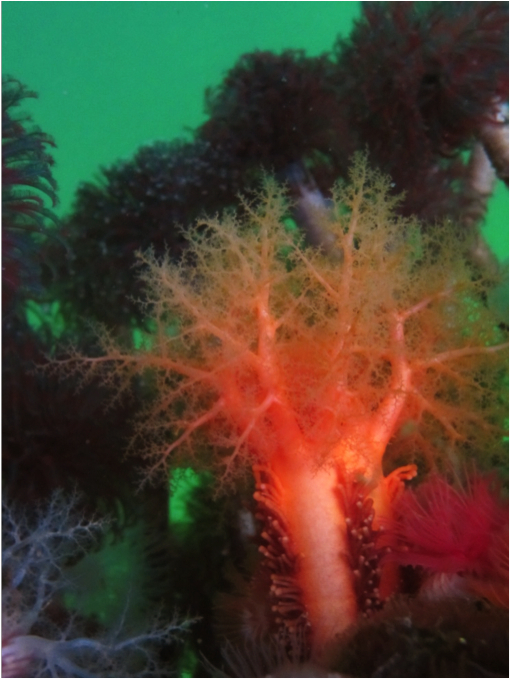 Orange sea cucumbers living on the Hakai Institute dock among feather duster worms and calcareous tube worms. Photos by, clockwise from top left: Julie Mundy, Thalia Christou, Teegan Bennington, and Kate Adams. The orange sea cucumber varies in colour from reddish brown to pinkish brown, and occasionally may be pinkish-white. Its elongated body is 10-25 cm long and bears 5 rows of brown tube feet along its length. 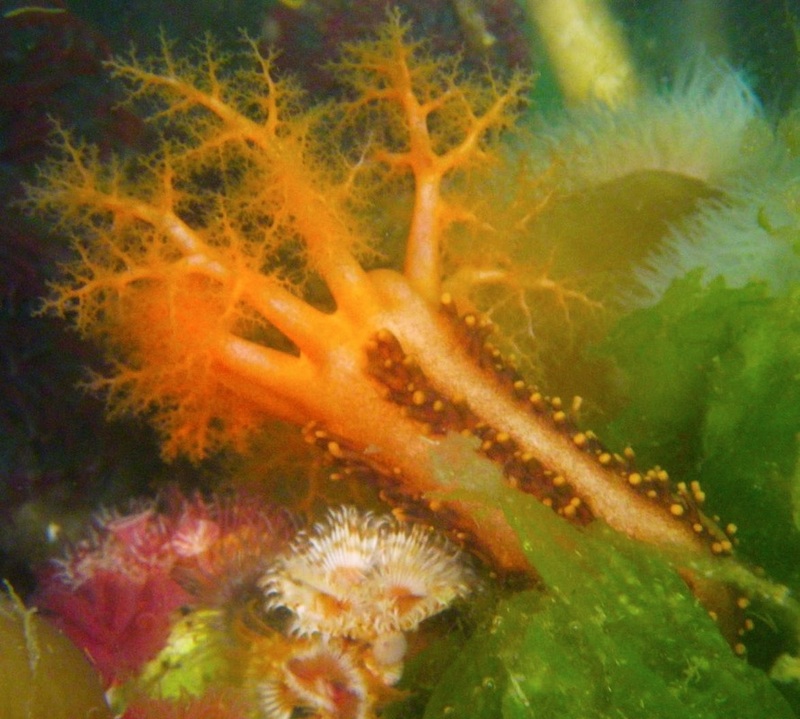 Ten finely-branched, bushy bright orange to orange-red tentacles extend from one end of the body. These tentacles may be the only visible part of the animal, as the rest of the body is often hidden in a crevice or under rocks. A sea cucumber out of water, without its tentacles extended, can appear quite different from one in water and safely wedged between rocks. This sea cucumber can be found wedged between or under rocks or other shelter, with its tentacles exposed and extended. It lives from the low intertidal to 225 m deep and is most abundant and common in areas with currents. Its range extends from the Aleutian Islands to northern Mexico. 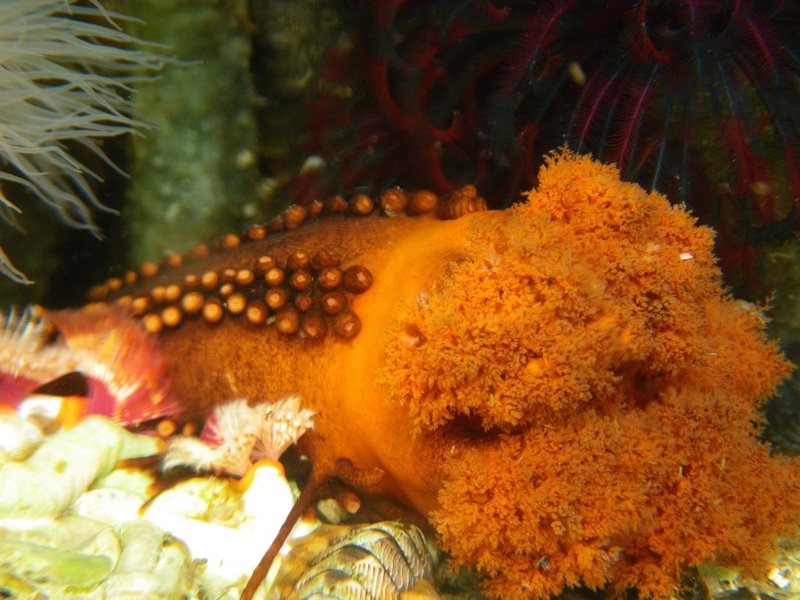 The orange sea cucumber is a suspension feeder: it uses its extended oral tentacles to catch plankton and detritus, and then draws the tentacles into its mouth one at a time to ingest the food. It is preyed on by the leather star (Dermasterias imbricata) and other sea stars. 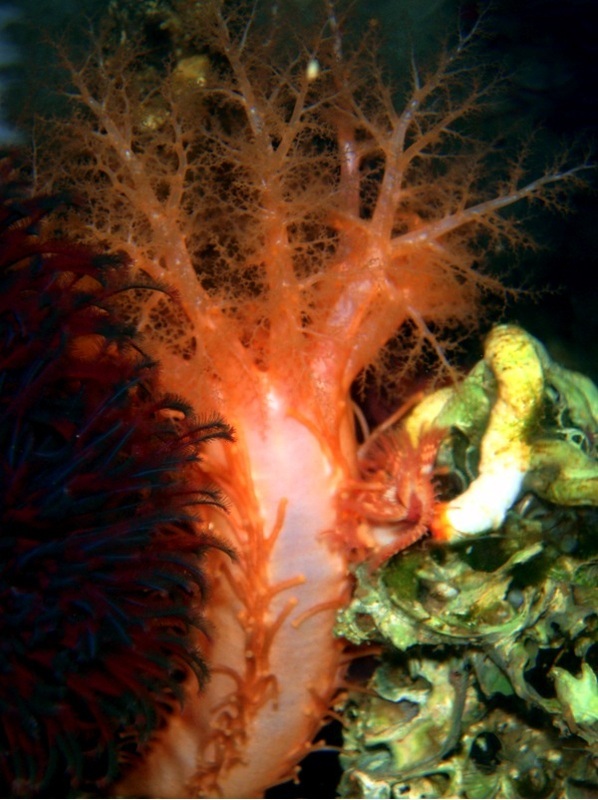 Learn more about orange sea cucumber biology on the E-Fauna species page. Adams, M.J. (2005). Cucumaria miniata (Red sea cucumber). Beach Watchers. Washington State University. Accessed 12/11/2014. Harbo, R. M. (2011). Whelks to whales: Coastal marine life of the Pacific Northwest [revised]. Madeira Park, BC: Harbour Publishing. P. 184. Lambert, P. Cucumaria miniata (Brandt, 1835). In Klinkenberg, Brian. (Ed.) E-Fauna BC: Electronic Atlas of the Fauna of British Columbia. Lab for Advanced Spatial Analysis, Department of Geography, University of British Columbia, Vancouver. Accessed 12/11/2014. Williams, K., Helmstetler, H., Cowles, D. (2005). Cucumaria miniata (Brandt, 1835). Invertebrates of the Salish Sea. Rosario Beach Marine Laboratory. Accessed 12/11/2014.